Photo by Miami-Dade Aviation Dept. The ComReal Miami Industrial Team had the opportunity to tour both the air cargo warehouses and the air maintenance facilities at Miami International Airport (MIA). We also attended a presentation by the Director of the Miami-Dade Aviation Department, Jose Abreu, who shared with us the statistics on the air cargo tons and dollar volume, top trading partners. 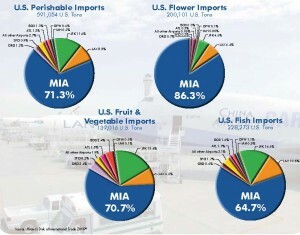 MIA simply dominates the entire nations air cargo industry in perishable imports. Here are the stats: 71% of perishables, 86% of flowers, 70% of fruits & vegetables and 64% of seafood fish imports. We also toured the former AeroThrust facility at 5300 NW 36th Street in Miami which is comprised of an empty hangar along with the air maintenance facility, mezzanine storage, warehouse and office space. The property has air field access. At the time we toured, AeroThrust was preparing for the bankruptcy auction. Additional facilities at Miami Int’l. Airport include the cargo clearance center, plant protection quarantine inspection station, animal plant health inspection station, cargo access tunnel and the fumigation facility. Located nearby, is the Miami Airport warehouse at 7000 NW 30th Terrace, Miami. This 127,000 sq. ft. Miami warehouse building is currently be marketed for sale or lease by ComReal Miami.